Select Equipment Co. stocks all types of new and reconditioned electrical transformers for sale. From large industrial transformers to small control transformers, we have you covered when you need one fast! 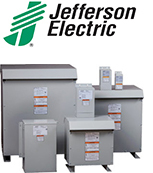 Select Equipment has teamed up with Jefferson Electric transformers to provide you with the very best dry-type transformers. We are a stocking distributor and can provide very competitive pricing for your project. Call 888-459-5191 to speak with a Jefferson Transformer specialist about your needs or to inquire about any of our power transformers for sale.